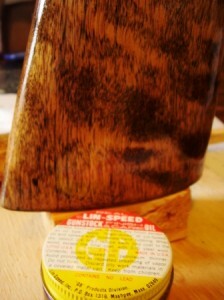 We decided to make a project of doing some gun-stock refinishing work and getting a brand new GB LinSpeed MicroMesh Kit was the perfect impetus to get the ball rolling. The stock in question comes from a 31 year old shotgun we have taking up safe space. While certainly no “safe queen” and not a firearm you’re likely to see in the velvet-roped, mahogany-clad Gun Library at Cabela’s, the practical single-shot 12ga has served us well to harvest more than its fair share of small game and clay birds and it deserves a little TLC.